Protect yourself and your hammock from sun, snow, wind, and rain with Grand Trunk's Abrigo rainfly. These spacious rain shelters can be set up in many different variations to ensure maximum protection in any weather conditions. Each rainfly includes aluminum stakes and guy lines, so you can quickly and easily set up camp over the water, high in the trees, or between buildings in the city. Protect yourself and your hammock from sun, snow, wind, and rain with Grand Trunk &apos;s Abrigo rainfly. These spacious rain shelters can be set up in many different variations to ensure maximum protection in any weather conditions. 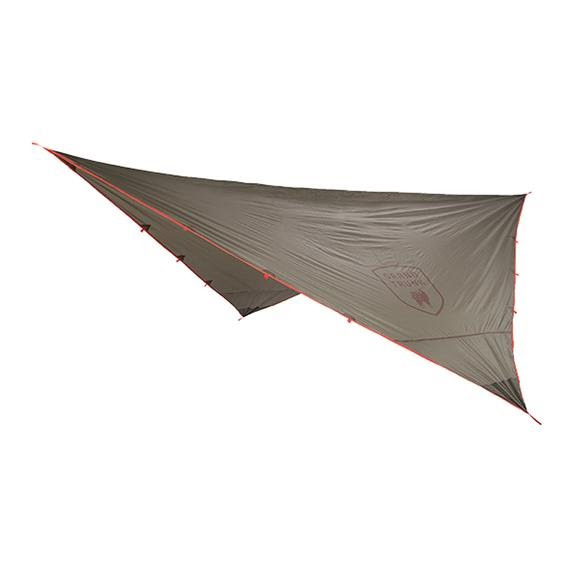 Each rainfly includes aluminum stakes and guy lines, so you can quickly and easily set up camp over the water, high in the trees, or between buildings in the city. For added protection, each Abigo rainfly features a durable DWR coating. Wherever your adventure takes you, these waterproof rain shelters ensure that you stay warm, dry, and protected. Change the way you camp and experience nature.